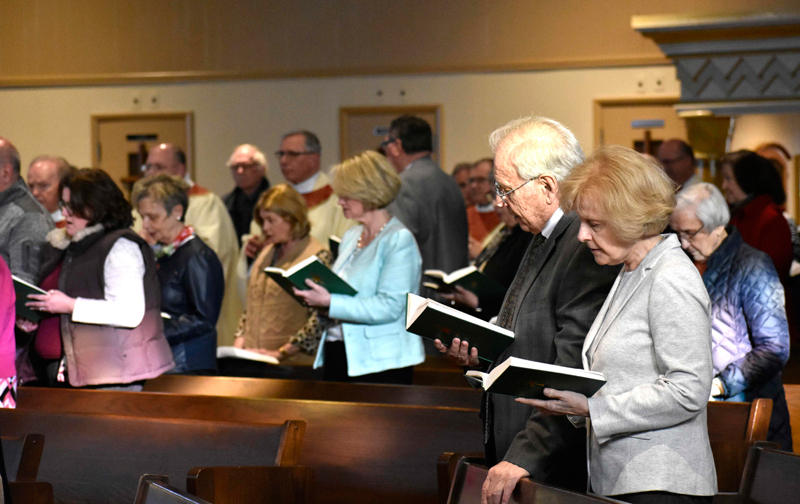 “There’s no better way to start our efforts with the Bishop’s Annual Appeal (BAA) than with the greatest prayer of all – the Holy Sacrifice of the Mass,” said Bishop Alfred Schlert, main celebrant and homilist of an evening Mass April 3 at St. Elizabeth of Hungary, Whitehall that kicked off the 2019 BAA in Lehigh County. The Diocese of Allentown and BAA Trust Advisory Board hosted the evening that launched this year’s appeal, “Because We Are Catholic,” which has a goal of $4.6 million to help those in need. 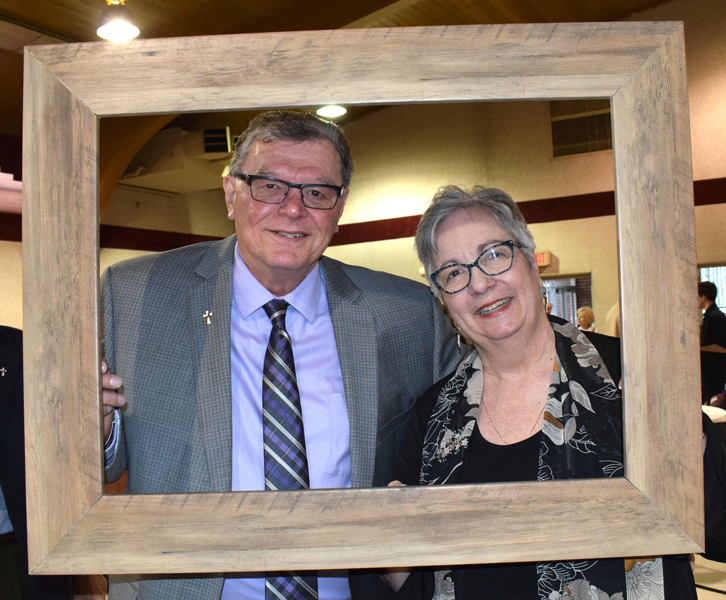 The liturgy was followed by a reception in the parish hall, which included presentations by two BAA Trust Advisors: Deacon Michael Laroche, who serves Holy Trinity, Whitehall; and Ron Derstine, parishioner of St. Joseph, Limeport for over 25 years. The appeal always begins after Easter. Principal concelebrants of the liturgy were Father John Pendzick, pastor of St. Elizabeth of Hungary; and Monsignor Daniel Yenushosky, pastor of Holy Trinity. Also concelebrating were other priests of the Lehigh Deanery: Monsignor Edward Coyle, pastor of St. Ann, Emmaus; Father John Gibbons, pastor of Sacred Heart of Jesus and Immaculate Conception BVM, Allentown; Monsignor Gerald Gobitas, pastor of St. John the Baptist, Whitehall; Monsignor Thomas Hoban, in residence at St. John the Baptist; Monsignor David James, Diocesan vicar general; Monsignor John Martin, pastor of St. Peter, Coplay; and Monsignor Francis Schoenauer, pastor of the Cathedral of St. Catharine of Siena, Allentown. In his homily, Bishop Schlert said Catholics, and all Christians, grew up thinking of God as the Father, but “the Jewish people didn’t think of him in such endearing terms.” He referred to the evening’s Gospel, John 5:17-30, when the Jews wanted to kill Jesus even more because he called God his own father – Jesus said he can do nothing without his Father. “As we make up our Catholic communities of families, we work in concert with the Father, Son and Holy Spirit,” Bishop Schlert said. “We believe our faith and Church is guided by the Holy Trinity. “Just like Jesus, we can do nothing without the Father. And without the cooperation of each other, it’s hard to get things done. The Bishop thanked everyone for their efforts with BAA, and asked them, in this season of Lent, if there is anything keeping them from living in concert with the Holy Trinity. As the evening segued into the reception, Father Pendzick led those gathered in a prayer and Paul Acampora, secretary of the Diocesan Secretariat for Stewardship and Development, offered words of welcome. Acampora said news stories say that people are not giving to the Church, but said that’s not true. The event included a screening of the BAA video. In 2018, BAA supported community services with $2,153,000, education $846,000, vocations $508,000, parish life $423,000, parish sharing $370,000 and administration $300,000. As Derstine addressed the group as it noshed on tasty offerings, he said the BAA Board of Trust Advisors was formed in 2012, and all gifts are received and administered by the trust advisors. Derstine focused on the protection and segregation of trust assets, explaining they are only for the appeal fund. The 12-member board of volunteer community leaders and parishioners from across the Diocese of Allentown was appointed by the Bishop. There is always at least one representative of every county in the Diocese. BAA, he said, provides such things as housing services, helps seniors, provides counseling, and aids faith development through the Secretariat for Catholic Life and Evangelization, including ministry to youth and young adults. It also helps the Diocese’s three special learning centers, including Mercy School for Special Learning, Allentown. Deacon Laroche said BAA also helps seminarians, noting there are nine men in Lehigh County preparing to be priests. “Thank you for coming tonight as we begin what we hope is another wonderful year,” Deacon Laroche said. Humbly, Bishop Schlert made clear he doesn’t like the focus on “bishop” in the appeal. “It’s the Catholic Community Appeal. It’s all the people who do the work in the Diocese, and the people who are served,” he said. “We approach services and life as Catholics with different views sometimes, and we’re proud of that,” Bishop Schlert said. “Because we’re Catholic we do great things with God’s blessing and guidance. Anyone with a need can come to us and be served. Because we’re Catholic we do God’s work day in and day out. The evening was a real family affair for Mike and Emily Spear, parishioners of the Cathedral, who attended with their eight children, from 13 years to 12 weeks old: Theodore, Bernadette, Adelaide, Teresa, Veronica, Phoebe, Leo and Rosemary. Emily Spear noted St. Adelaide is the patron of large families. “Catholic Charities is not just for the Catholic Church.” The Spears are involved in volunteering at a soup kitchen and nursing home, noting all these things are important. “Giving back to the community is not important in some abstract sense, but because Jesus is present in every human individual, so we are excited to give back to the community, to Jesus in everyone around us, and as Mike said, that means that Catholic Charities is not just about Catholics,” Emily Spear said. “One of our children said it was an extra special Communion today because there were nine priests,” Mike Spear said. “Tonight is joyful,” Emily Spear added. “It is great to be with so many people who want to work together to do good. 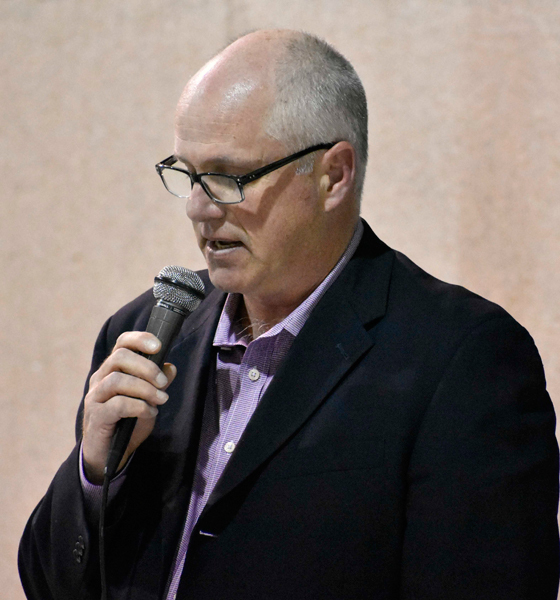 Rod Derstine offers his presentation during the kickoff reception. Bishop Alfred Schlert, center, celebrates the Mass with, from left, Msgr. Edward Coyle, Monsignor John Martin, Monsignor Thomas Hoban, Monsignor David James, Father John Pendzick, Monsignor Daniel Yenushosky, Monsignor Francis Schoenauer, Father John Gibbons and Monsignor Gerald Gobitas. Faithful of the Lehigh Deanery attend the evening liturgy. Enjoying the evening are, from left, Elizabeth and Joe Bechtel, parishioners of Assumption BVM, Slatington; and Rosemarie and Joe Rieker, parishioners of Annunciation BVM (St. Mary’s), Catasaqua. 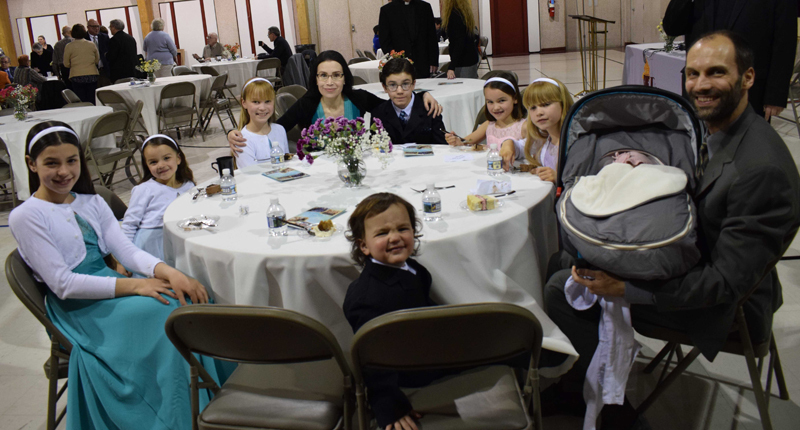 The Spear family, parishioners of the Cathedral of St. Catharine of Siena, Allentown, enjoy the evening, clockwise from left, Bernadette, Phoebe, Adelaide, Emily, Theodore, Veronica, Teresa, Michael holding Rosemary and Leo with his “best smile” on. Deacon Christopher and Cathy Kinsella of St. Thomas, More, Allentown celebrate the kickoff. 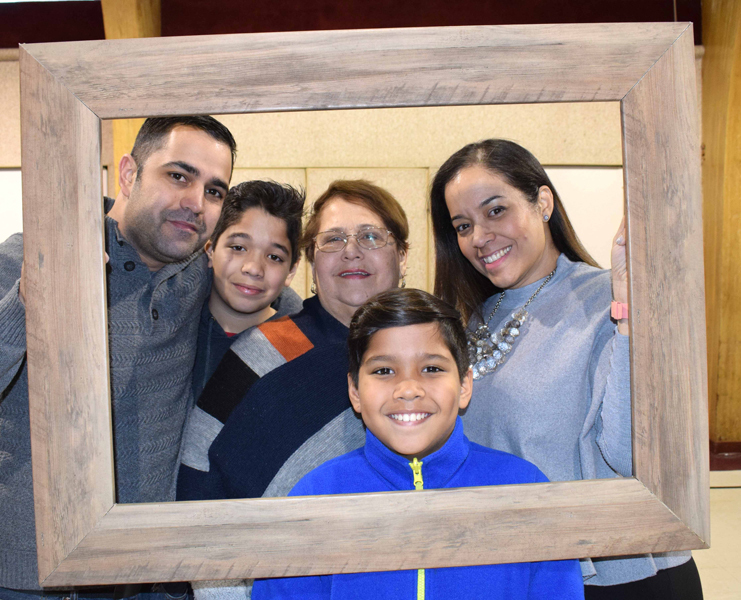 The Rodriguez family, parishioners of St. Paul, Allentown, enjoy the evening, from left, Alfred, Samuel, Seria, Matthew and Raysa. 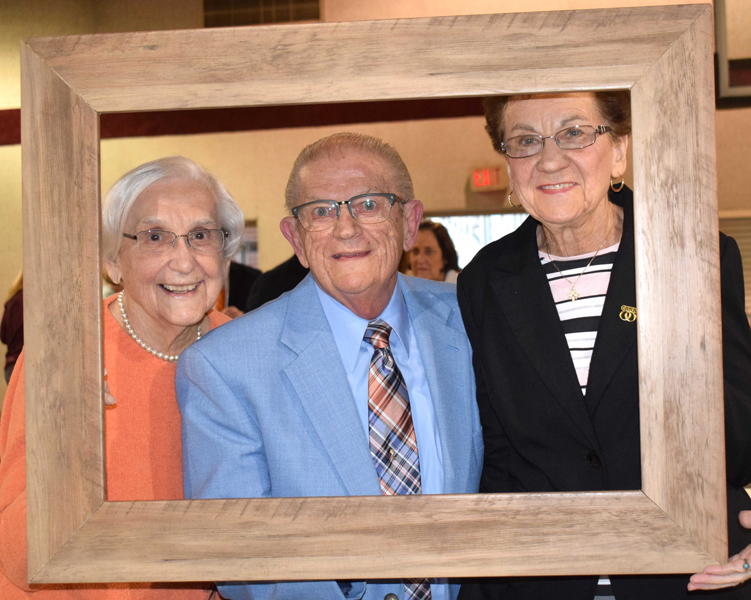 Enjoying the celebratory evening are, from left, Mary Ann and Bob Kulhamer and Helen Wolfer, parishioners of St. Elizabeth of Hungary. 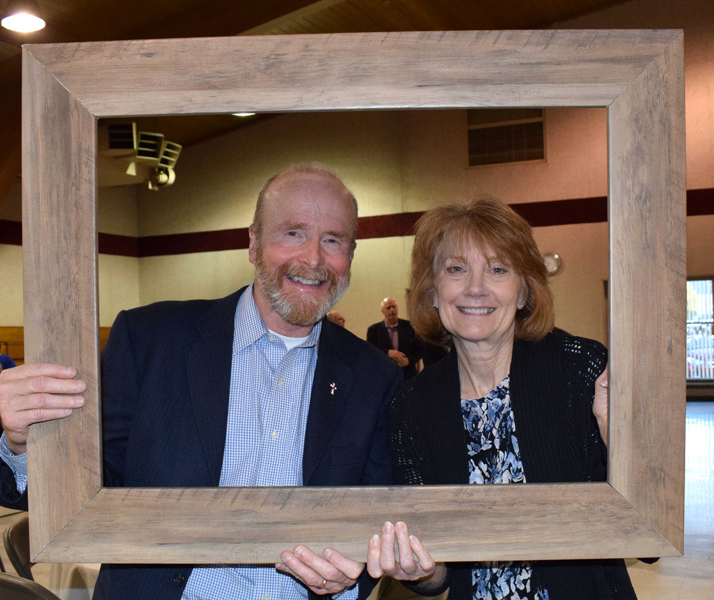 Deacon Carl and Peg Readinger of St. Joseph the Worker, Orefield enjoy celebrating the kickoff.